I moved to Berwick-upon-Tweed from Leeds in January 2011 and soon after I read a notice in the Berwick Advertiser about a proposed transcription project around the Battle of Flodden. In my experience, despite the fact that the outcome of the battle ultimately resulted in the Union of the Crowns of England and Scotland in 1603, Flodden is little known outside the Borders. However, I decided I would like to become involved. After the training sessions given by Linda Bankier, we were given copies of relevant documents to transcribe. In a couple of them, the name of William Gascoigne cropped up. This connected with me, especially when in other documents, William Gascoigne of Leasingcroft was mentioned, including “The Trewe Encounter”. In 2008, I joined the Leeds Archaeological Field Society (LAFS). It had been started in 2005 because of proposals for the redevelopment of a large area of east Leeds. There were a lot of old farms in the area and the main intention of the society was to record the farm buildings before they disappeared. A number of farms had already been surveyed and when I joined LAFS, they were working on an excavation at Lazencroft Farmhouse. Lazencroft had been the estate of the Gascoignes until the late sixteenth century. The purpose of the excavation was to see if there was any trace of the manor house. The present owner was renovating the eighteenth century building with a view to living there and had invited the group to dig on his land. The Trewe Encounter, featuring William Gascoigne’s name fifth on the list of noble men. BRO 1776-6Lazencroft is situated in the hamlet of Barnbow and is in the ancient parish of Barwick-in-Elmet, seven miles east of Leeds. Coincidentally, Barwick, like Berwick also comes from Old English meaning “barley wick”. I already knew that the Gascoignes originated from Gascony in northern France and came to England at the time of the Norman Conquest. By the thirteenth century, the Gascoignes had an estate at Gawthorpe Hall, at Harewood in north Leeds. I have been unable to find where they were based in the intervening period. The Church of All Saints in the grounds of Harewood House not only houses the Gascoigne chapel but also contains the largest number of alabaster monuments of the fifteenth century in any parish church. One of the figures is Sir William Gascoigne, (c1350 – 1419) Lord Chief Justice of England, depicted in judge’s robes. 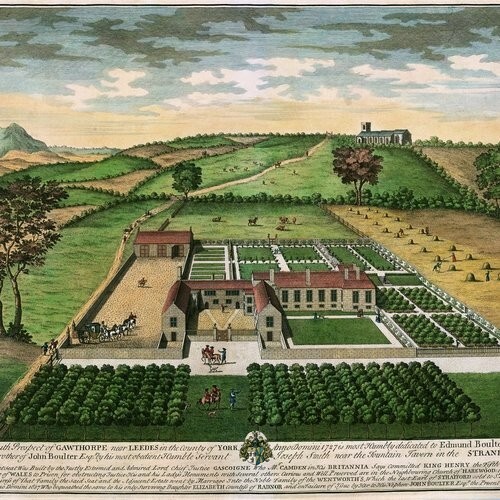 After various changes of ownership, Gawthorpe was finally purchased in 1738 by Henry Lascelles, a trader with interests in the West Indies. Gawthorpe was demolished in 1773 when the Lascelles moved into the newly built Harewood House which is still owned by the family today. Sir William’s younger brother, Nicholas Gascoigne, acquired Lazencroft in 1392 and it remained in the family until the late sixteenth century when they moved to Parlington Hall. Reading through some of the other completed transcriptions relating to Flodden, I found that William Gascoigne along with others including Lord Dacre of Gilsland, Henry Clifford of Skipton, Rauf Scrope, Richard Neville, Sir Marmaduke Constable and William Percy was one of the signatories of the letter (National Archives SP49 /1 Folio 17) sent from Thomas Howard, Earl of Surrey to King James IV from Wooler Haugh on 7 September 1513, two days before the battle. William Gascoigne had therefore made an impression in the highest quarters. In this letter, Surrey is confirming his intention to meet James on the plain of Milfield between 7 in the morning and 3 in the afternoon on the Friday. The battle took place on Friday 9th September. In the document known as “The Trewe Encounter”, which describes the battle itself, Surrey is said to have divided his army into two sections, the vanguard being nine thousand strong under the command of the Lord Admiral, his son, whilst Surrey led the rearward. Sir William Gascoigne is named as being in the breast of the vanguard under the banner of St Cuthbert along with Lords Lumley and Hylton amongst “diverse others”. After the battle, honours were distributed and William Gascoigne junior, along with at least forty other soldiers, was knighted for his efforts. I have tried to find dates for both of these Williams but it is quite confusing. There were so many Williams in the family that they were given numbers, e.g. William VIII, William IX. On the Roots Web website, many people claim to have them in their family tree and their dates do not always match up. There are three Sir William Gascoignes who could have taken part in the Battle of Flodden. William XIV was born in the 1450s at either Gawthorpe or Lasincroft. He would have been roughly the same age as the Earl of Surrey. His wife was Margaret de Percy, a daughter of Sir Henry Percy, 3rd Earl of Northumberland. Sir William XV Gascoigne was born at Lasingcroft about 1477 and he had a son, William XVI Gascoigne born about 1500. This would make him aged twelve or thirteen at the time of the battle. Although Harry Hotspur was thirteen when he fought his first battle, at the siege of Berwick, I’m not sure it was this William who was knighted so I assume that the Williams XIV and XV are the father and son that took part in the battle. Despite their heroics in the battle, neither Gascoigne seems to have covered himself with glory. In the state papers dated 22 October 1513, note was made that Henry VIII had commanded Lord Dacre to make two raids into Scotland via the Middle March. Lord Dacre later wrote to Ruthal, Bishop of Durham stating that Lord Howard was displeased that Sir William Gascoigne (and others) the day after the battle, had been commanded by the Lord Treasurer to help Scrope “in securing and conveying the guns but they all went home with seven days’ wages in their purses.” This probably explains why the Gascoignes weren’t allocated any horses after the battle. When I started work on this project, I had no idea that I would come across names connected with places I was familiar with further afield in northern England. It has shown me and illustrated the distance people travelled to fight at Flodden.